I have been so focused lately on weeds and their medicinal and nutritive properties, that I have totally forgotten about garden or kitchen herbs. A trip to my mini herbal garden in order to pick fresh oregano and basil for a sauce to go with Jachym´s home made pasta (which was fantastic, by the way and I might actually share the recipe some day) reminded me of the many amazing health benefits of these classic kitchen herbs. So inspired and once again reminded that nature has so much to offer for our health and nourishment, here is another post from the HERBS FOR DOGS series. Most of us know and use dill when canning pickles, on grilled or staked salmon dishes or in various dips. But this is all human food. You probably haven´t really thought of adding dill into your pet´s food. As a matter of fact, the list of health benefits and nutritional values of this garden herb is huge and impressive. Let´s first look at its nutritional benefits. Both the plant and its seeds are rich in minerals such as calcium, phosphorus, iron, magnesium, potassium, trace amount of sodium (so no need to worry, besides, the dosage of dill you would be giving your dog is small, so no risk of too much sodium intake here) and nicely bio available zinc. It is also fairly rich in B vitamins: riboflavin, niacin and thiamine, plus vitamin A. Among contained amino acids are anethofuran and limonene, known for their function of increasing the production of cancer fighting enzymes, such as glutathione S-transferase. This enzyme is potent at eliminating carcinogenic (cancer causing) cells from the organism. 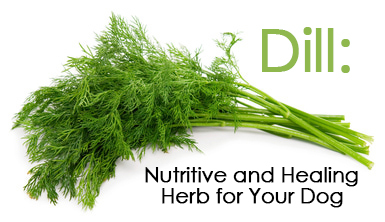 This makes dill not only a chemoprotective, but also a great detoxifier, protecting the body from free radicals. But these are not the only great medicinal properties of dill. It has proven itself as an antibacterial acting agent as well. Research has proven dill to be effective against an impressive number of medical conditions, such as diabetes, memory deficits or digestive problems in both animals and humans. Decrease in the need of insulin intake in diabetic individuals has been shown after using dill, as the herb helps regulate blood sugar and insulin in the body. In horses, dill is reported to be effective also for Cushings disease and metabolic syndrome. It also helps to tonify liver and pancreas so its use during and after disease for recovery and immune system boost is highly recommended. Similarly to mint and parsley, dill helps against bad breath. You can even mix these three herbs together into your dog´s food in case bad breath is an issue. 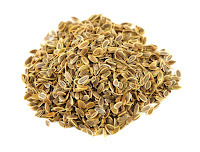 Ground dill seeds help expel intestinal worms from the body. Used topically together with yarrow in an infusion, it is an effective natural flea repellent. Another good external use is to treat skin irritations, inflammation and rash. Weather your dog suffers from chronic constipation or bloating, dill is here to help as well. It generally promotes digestion and is proven effective against stomach ulcers. If your dog passes a lot of gas, add a teaspoon of dill seeds into his food daily. 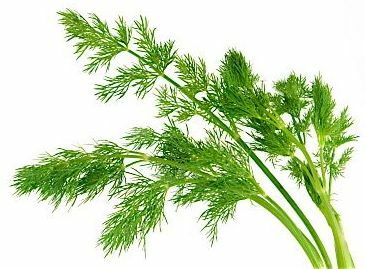 Dill is a safe herb to feed, not containing any large amounts of known harmful substances that many other herbs do (such as oxalates). One tea spoon of dill seeds offers a good amount of the above mentioned vitamines, minerals and aminoacids. Dill is also tested to be a non-alergenic nutritional supplement, so no worries on this front either, and is safe to use not only for dogs and horses, but also cats.